I'm sure that many of you have seen the latest Next Autumn/Winter advertisement which debuted recently, I for one really do adore it; the feel good music, location, and the cinematography are just lovely. 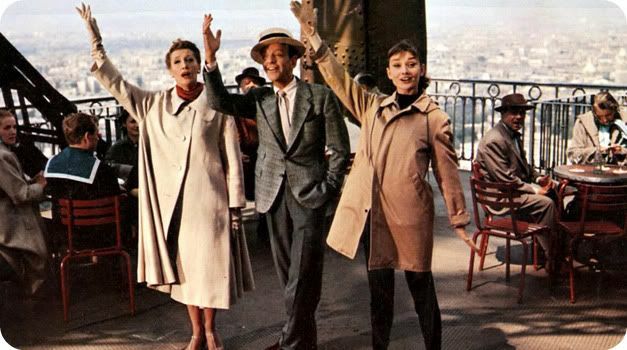 The advertisement reminds me of one of my favourite scenes from the movie 'Funny Face', where Audrey Hepburn, Fred Astaire and Kay Thompson are exploring Paris, all singing 'Bonjour, Paris!'. Can you also see the similarities? The dancing, the running around Paris, even the coat Emanuela de Paula is wearing below is somewhat similar to that of Audrey's and Kay's. Next seem to have taken great inspiration from 'Funny Face'. And why not? It's such a beautiful musical. I have to be honest, half a year ago I would never have looked in Next as a high street store I would personally consider buying my clothes from, but since seeing Next pieces appearing on other blogs, I've been regularly popping in to see what's on offer. I really do like the Autumn/Winter collection, I wouldn't have wrote this post otherwise, and I currently have a few pieces I am constantly drawn to when I go in store, including this striped top, this lovely satchel and this chunky cream cardi. As some of you may know, I, alongside a few other bloggers have been pretty connected with Next recently, so when I recieved an email asking if I'd like to be involved in an exclusive pop-up shop launching across a handful of UK style blogs I thought I'd give it a go! I got to pick four of my favourite looks from the advert, two of which are above, then the team created the pop-up shop below stocking the key items from each look. It's pretty darn good, click on the items below to find out a little more about each piece. So, have you always shopped in Next or have you just recently started to? And also, what do you think of the latest campaign? Love, Jazzabelle. wow all of those pieces are wonderful! The whole campaign is to perfection. Oh, I just love the TV ad with the models running around Paris - it makes me want everything for my trip there next month!! I got involved with this initiative too - wish I'd made the connection with Funny face though! Great idea.. And I love that film. It's one of my favourites - the outfits, the cinematography, the staged sequences. Just perfect! The look with the shearling jacket seems to be pretty popular - I chose that too.. And I agree, getting involved with Next through the blog has really increased my appreciation of it as a brand. I'm lovvvvving Next atm- never thought I'd say that, lol! Just bought their leather pants and they are TDF!